Part 2 will invite each teacher to develop their own teaching as is suitable for the groups of students they already teach. For example, if you primarily teach to groups of seniors you will be able to refine your offerings for that group. If you primarily teach to a younger audience using a more dynamic asana practice you will be able to refine that style of teaching. The program is suitable for teachers with many varied backgrounds. After our Skype call I discussed my experience with Robin’s teaching. I would be happy to do the same with you! Let’s chat via email or set up a phone call to discuss. Contact me at meaghanburridge@gmail.com. I also told the group about our intention to open up two of each seven day intensive to the public for mixed-level workshops. This will create many learning opportunities for us as we experience Robin’s teaching in the context of a public event. Another option for getting to know Robin is to register for her online program The Roots of Yoga Part I. If you decide to register for the 300 hour TT before the early bird deadline the cost of ROY will be deducted from your registration fee. Finally, we took a trip over to the Carton Loft where our training will take place. 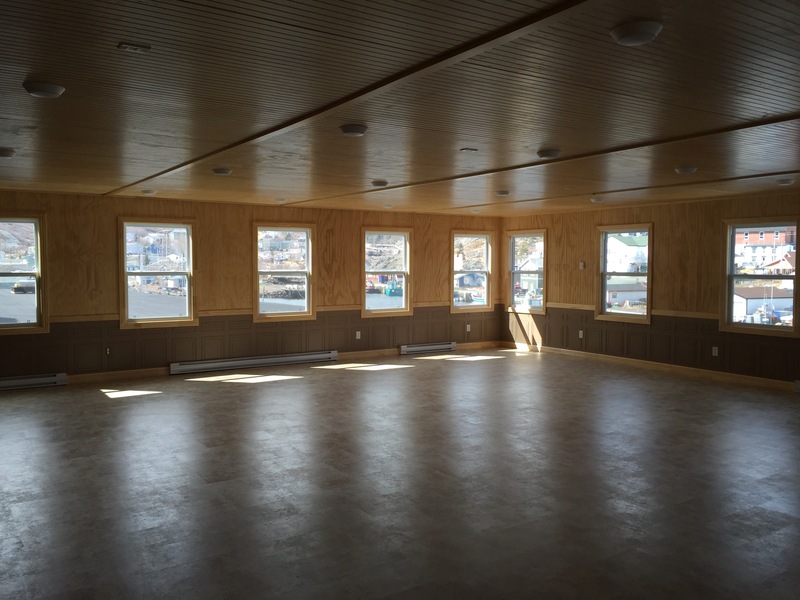 A panoramic view of Petty Harbour, windows that open to let the fresh air in and a wide open practice space make the Carton Loft the perfect place to spend 7 days in the depths of yogic study and practice. This entry was posted in Uncategorized on April 18, 2016 by meaghanburridge. Lucy: Mom, what pose is that? Me (chuckling): well, it’s supposed to be Sundial Pose but I’m not doing it very well! Lucy (breaking out into song): it’s ok mom! You can do it! Just keep trying and you will get better and better and better! This entry was posted in Uncategorized on February 9, 2016 by meaghanburridge. Anahareo Doelle is a 2012 graduate of the Yoga Teacher Training NL 200 hour program. For Anahareo, this program offered the perfect foundation of yoga training. It was also an opportunity to meet like-minded yogis and to enjoy the fabulous group atmosphere that developed. Anahareo has a background in competitive gymnastics and diving. She is also a graduate of the National Circus School of Montreal where she specialized in Aerials. For the past fifteen years she has performed in various shows in Canada, Switzerland, Italy, Norway, Japan and Germany. In 2012 Anahareo also became a certified Pilates instructor. In 2014 Anahareo combined her love of yoga with her skill in Aerial performance to offer Aerial Yoga. She recently opened her own aerial school “iFly Aerials” at Wonderbolt’s new downtown studio, The S.P.A.C.E. She teaches Aerial Yoga, Aerials for Kids and adult classes and she loves sharing her passion for aerial strength and yoga calm. Congratulations Anahareo on bringing a new and fabulous concept to the St. John’s community! This entry was posted in Uncategorized on December 11, 2015 by meaghanburridge. Graduates of our 2012 YTT-NL program Carolyn Hapgood and Helena Butler have gone on to make a big impact in the local wellness community. Since graduating with their 200 hour certification Carolyn and Helena have gone on to become Registered Yoga Therapists (a 200 hour certification is a pre-requisite for this training) and Internationally Certified Neurogenic Yoga™ Teachers. In fact, they are the only two Neurogenic Yoga Teachers certified in Canada! Neurogenic Yoga™ combines postures, breathing and a natural shaking/tremoring response of the body to relieve stress, tension and trauma. Neurogenic Yoga™ is especially suitable for treating chronic pain, daily stress & pent up tension, Post-Traumatic Stress Disorder, Parkinson’s Disease, Thoracic Outlet Syndrome, to name a few. It may be suitable for almost anyone with the exception of pregnant women. Learn more about Yoga Therapy and Neurogenic Yoga by reaching out to these experienced teachers. Carolyn’s website can be found here and you can connect with Helena here. This entry was posted in Uncategorized on November 23, 2015 by meaghanburridge.